Belgaum : Nine ‘Hindutvavadis’ have been arrested last month in connection with so-called explosives issue at Nalasopara and killing of Dr. Dabholkar. 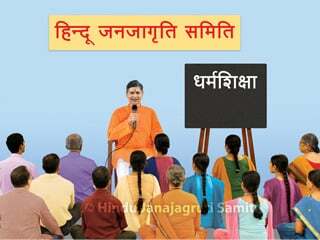 None of them belongs to Sanatan Sanstha; even then, baseless demand is being made for imposition of ban on Sanatan by few political parties, organizations, so-called progressive and Muslim leaders. Some media channels are also telecasting shocking and misleading news making noise about ‘Hindu Terrorism’. On the other hand, supporters of naxalites arrested in connection with Koregaon Bheema are conveniently sheltered. It is double-standard. Those who talk about ‘Hindu terrorists’ even before cases filed against Hindus are resolved and call naxalites as thinkers, social workers and human rights activists, have been exposed. 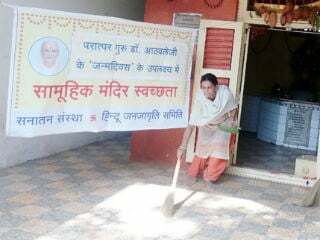 Who should be supported, Sanatan Sanstha which is righteous and promoter of truth or those, who are under the veil of secularism and progressiveness, helping naxalites ? This question was asked by Shri. 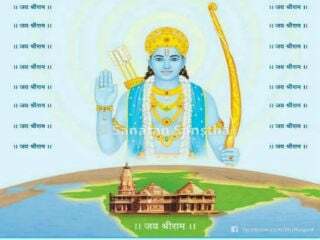 Rhushikesh Gurjar of Hindu Janajagruti Samiti (HJS) while reminding that God protects those who protect Dharma. 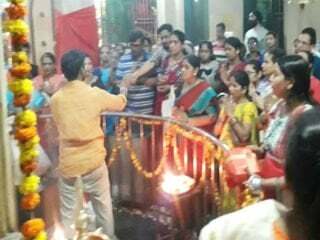 Demonstrations were staged under aegis of ‘Rashtriya Hindu Andolan (RHA)’ in support of innocent Hindus arrested in connection with Nalasopara explosives case and against demand for imposition of ban on Sanatan. The demonstrations were staged on 30th September. ‘Hindutvavadis’ also demanded in detail inquiry into conspirators targeting HJS and like-minded ‘Hindutvavadi’ organizations. Many people stopped on their way and tried to know the subject of demonstrations while it was going on. Copies of special issue ‘Sanatan Satyadarshan’ of ‘Dainik Sanatan Prabhat’ were distributed. Shri. Anil Kuvalekar, a devout Hindu showed interest in participating in such drives whenever held in future.